ATB 5 oz - Bullion. ATB 5 oz - Tube. ATB 5 oz - Graded. 90% Silver Proof Half Dollars. First Spouse 1/2 oz Gold Coin. Quarter - State Territory Sets. Silver - 10 oz Britannia Bullion Bar. From a brilliant legacy stretching over centuries of British coinage history, Britannia extends the influence of her realm once again! New for 2018 The Royal Mint unveils Britannia in a stunning new form and design, the Silver Britannia 10 oz Silver Bar. Jody Clark, the mint's Chief Engraver designed this fresh new interpretation of Britannia and it is already making a huge impact within the bullion community. Britannia 10 oz Silver Bar. The obverse of the bar presents Britannia looking to her left, always alert to any threats upon the realm she is sworn to defend. She is arrayed in a fine white gown, yet protected by a by a fitted, scalloped-breastplate. Upon her head is a finely-designed helmet, with its face guard raised. A design of rolling waves graces the helmet's head portion, while the crest displays fine horse hair standing high. In her left-hand Britannia grasps the Trident, with which she is ready to defend the seas. In her right-hand she holds her shield, which displays the image of Great Britain's flag, ready to defend the realm. The single inscription "BRITANNIA" is also displayed at the lower left, superimposed on the shield. Filling the background is a truly stunning wavy-line design. This represents the seas as a fitting tribute to strong British nautical history. As a symbol of strength and integrity, Britannia has for centuries been featured on British coinage. The bar's reverse design is no less striking. " Also included are the inscriptions "10 oz 999 FINE SILVER and unique serial number. As with the obverse, the background is filled with the wavy-line theme, and at the bottom is a scene of five cresting waves. The introduction of Britannia with a stunningly fresh design in silver bullion bar form is opening a new vista for collectors and investors alike. We are extremely pleased both with the awesome design, and the opportunity to offer the 10 oz and 100 oz Britannia Silver Bars! You may also be interested in the 1 oz Britannia Gold Bars. Contains 10 troy oz of. 999 fine silver in BU condition. Each bar comes individually packaged. 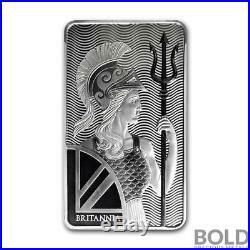 Obverse: Features a stunningly-fresh new design of Britannia, standing with a trident grasped in one hand and shield in the other, ready to defend the realm. The background is filled with a wavy-line pattern, representing British nautical history. The wavy-line pattern also fills the reverse background. The item "Silver 10 oz Britannia Bullion Bar" is in sale since Wednesday, November 14, 2018. This item is in the category "Coins & Paper Money\Coins\ World\Europe\UK (Great Britain)\Other UK Coins". The seller is "boldpreciousmetals" and is located in Austin, Texas. This item can be shipped to United States.